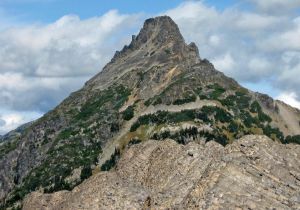 A rugged rock tower on the southeast side of Garibaldi Lake, and on the west side of the Sphinx Glacier. Access is most commonly done in the winter or spring by crossing Garibaldi Lake on skis to the Burton Hut. From the hut, gain the col between Guard Mountain and Deception Peak. Scramble along the south ridge across an exposed section to reach the summit.